Sure, we might not get Thanksgiving or Veterans Day to celebrate here in Thailand, but we do get to celebrate Loi Krathong! Don't worry, I can't pronounce it either! 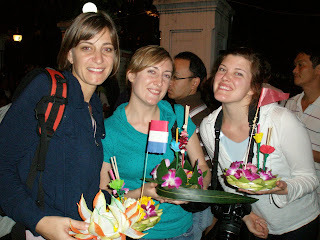 “Loi Krathong” is traditionally performed on the full moon night of the twelfth lunar month, which usually falls on some day in November. 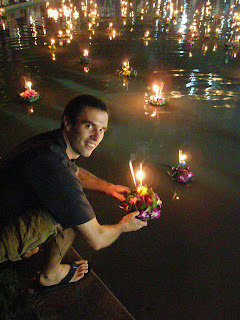 The floating of a ‘Krathong' – a banana–leaf cup – is intended to float away ill fortune as well as to express apologies to Khongkha or Ganga, the River Goddess. Some believe that the ritual is meant to worship the Buddha's footprint on the bank of the Narmada River, while others say that it is to pay respect to Phra Uppakhut, one of the Lord Buddha's great disciples. 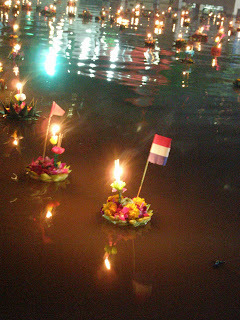 The Loi Krathong Festival is celebrated nationwide in Thailand, especially where there are rivers, canals or sources of water, with different unique characteristics. 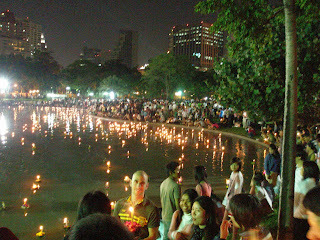 In other words... Daniel, myself and some teacher friends got our Krathongs and headed to the park along with thousands of other Thai people. It was a beautiful night and you could feel the excitement from everyone around you. 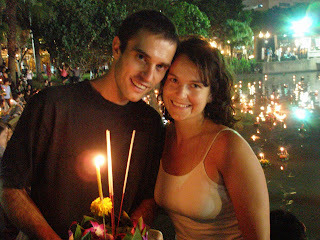 Daniel and I didn't get to make our own Krathong (like most people do) but a nice Thai lady got 30 Baht ($0.98 USD) for the one we bought of the street. We made a wish that our ill fortune would be taken away. We'll see if it works! 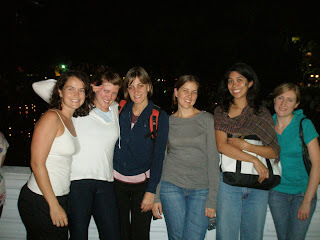 Hey we were there too!